The 2018 Winter Olympics are starting on February 8th. With the games just around the corner, we’re looking forward to marveling at events like the Opening Ceremony, alpine skiing, snowboarding, and bobsled. And maybe it has to do with the fact that we just saw I, Tonya, but we’re especially excited for figure skating. Let’s take a look at what Team USA figure skating has in store for us. 1 The U.S. skating team has a lot of new faces. Only five former Olympians are returning to the ice with Team USA this year, while nine skaters will experience their first Olympics in PyeongChang. 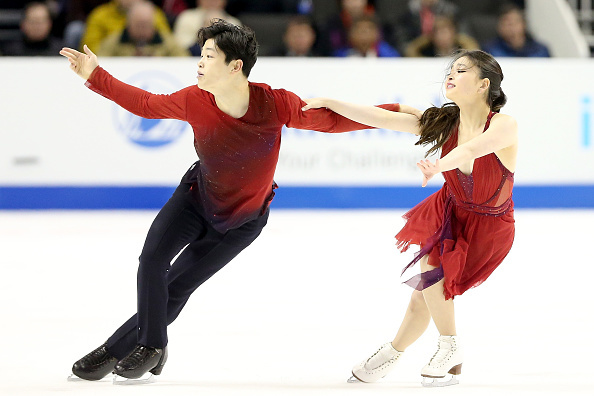 Among the former Olympians are the ice dancing duo Alex and Maia Shibutani, who made their debut in the 2014 Winter Olympics in Sochi. Overall, the team consists of three women, three men, three ice dancers, and one pair team. 2 Figure skating is one of the first events. Skating competitions will kick off on February 8th, the day before the Opening Ceremony. After that, skating events will resume on February 10th and continue for the duration of the games, with coverage generally starting around 4 p.m. ET. You can stream the Olympics online at NBC. 3 We could see an American woman win gold. The 2010 Olympian Mirai Nagasu can land the notoriously difficult triple Axel (she is only the second woman to do so). The New York Times has predicted that if she can land the jump during the South Korea Olympics, she could be the first American woman to take home gold for figure skating since 2006. 4 And one of the male skaters is expected to win. Nathan Chen is the only skater in the world who has ever landed five quadruple jumps during one show. And his record-setting history has led many to say the 18-year-old is the most likely U.S. skater to win gold this year. In January, Adam Rippon refused to visit the White House if the team is invited by President Donald Trump post-Olympics. But besides making headlines with his political statements, Rippon is the first openly gay man to compete for the U.S. in the Winter Olympics. We can’t wait to watch these incredible athletes perform during the South Korea Winter Olympics. Good luck to all the skaters, especially Team USA!